Charlotte may have left the Floating City, but she's not out of danger yet. On the run from the British Empire's clutches, she leads her group of exiles west and south, plunging into a wild world of shady merchants and curly river men on the way to New Orleans. But the more Charlotte learns about the revolution she has championed, the more questions she has. 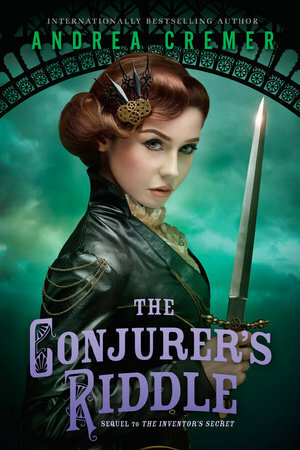 As she and her friends get to know the hidden tunnels that run below New Orleans, home to criminals, assassins, and pirates, and head deep into the mystical bayou surrounding the city, Charlotte must make a decision. Do the revolution's goals justify their means, or are some things too sacred to sacrifice? Well, I picked up a few things I totally missed in The Conjurer's Riddle prequel, The Inventor's Secret. I suppose that means that I zone out on occasion when listening to audiobooks. At the end of The Inventor's Secret, Charlotte has left the Floating City (which is New York City!) and is heading back to the catacombs where the rest of her friends (children sent out of the city by their revolutionary parents) when there's a terrible explosion. The British Empire has found the hideout, and the children are on the run. And yes, legit children, which seems really odd to me. Who sends there children away to be raised by other children? There are no adults in the catacombs and some of these kids are tiny! The band follow emergency protocols and make there way to New Orleans where everyone is forced to cover their faces with masks while in public (there was a long explanation as to why, but I didn't quite get all of that). Charlotte is still having boy trouble. Grave is still mysteriously the "Inventor's Secret", and apparently the revolutionaries are a little crazy. And that, right there, is what makes this interesting. It would be so easy to see the British Empire as evil and the revolutionaries as noble, but Cremer shows that in war, it's now black and white. That sometimes the end goal does not always justify the means. War is ugly, and scared people can be terrifying. Charlotte grew up a bit (just a bit) on her travels to the bayou, but in matters of the heart, she has a long way to go. But now there's a beautiful pirate in the mix who has caught the eye of our killer spy and all around warrior woman, Linnet. Still more alternate history than Steampunk which is a bit of a bummer, but I'll be eagerly awaiting book three!